Discover more about the rich history of the Smoky Mountain Area! Day Hikes in the Great Smoky Mountains National Park! 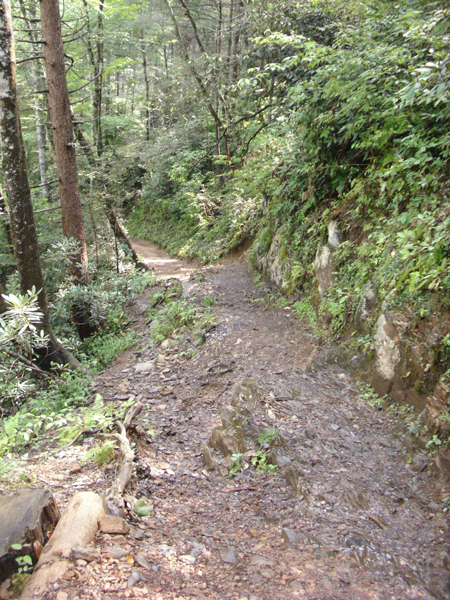 There are many different trails to hike in the Great Smoky Mountains National Park ranging from easy to moderate to strenuous. Whether you’re looking for a quiet forest walk and wildflowers or a hike by the river to an amazing waterfall, there is a hike for everyone! Here are a list of the hikes you can complete in a day. It is important to always hike prepared. Here is a complied list of things to bring with you on each day hike in the Smokies during the Summer months. Never hike alone, give a family member or friend your hiking itinerary and estimated time of return, always stay on the designated trail, don’t hike too quickly pace yourself, start early, check the weather forecast before heading out, know where to get emergency medical care, watch for signs of heat exhaustion, don’t pack too heavily, never approach wild animals, and remember to always have fun!! Gatlinburg’s 38th annual Craftsmen’s Fair is currently being held in the Gatlinburg Convention Center and will continue until Sunday July 28, 2013. The fair is open daily from 10:00 am to 6:00 pm and 10:00 am to 5:00 pm on Sundays. Admission for adults is $6.00 and children 12 and under are free. The Gatlinburg Convention Center is located at traffic light #8 on the parkway in downtown Gatlinburg. There will also be Country and Bluegrass Music Shows daily at the Craftsmen’s Fair. The shows will be held at 12, 2 and 4 pm daily and at 12 and 2 pm on Sundays. The Summer Fair will feature Tim Watson The “Fiddle Man” and Dennis Lee and Band. With over 200 booths of talented artisans, the Gatlinburg Craftsmen’s Fair is one of the only places that artisans from around the country can gather to demonstrate their talent and beautifully display their one of a kind crafts in the same place. 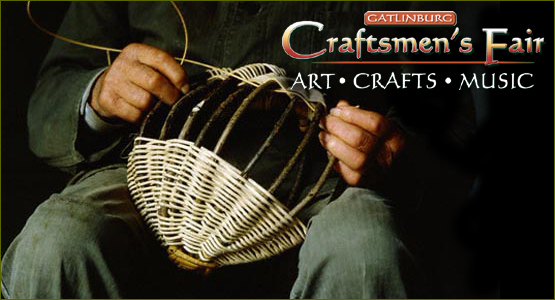 The Gatlinburg Craftsmen’s Fair is a truly magical event where such talent can be seen. Some participants in this year’s Summer fair include: Larry Burton, an award winning artist from Townsend, TN who uses watercolors on canvas; Sandy Hensley, a jewelry designer from Shelbyville, KY who is inspired by the spirituality of nature for her designs; and Charles Adams, a stained glass artist from Troy, Ala who has been participating in the Craftsmen’s Fair for nearly 30 years and is always a favorite. Have you ever seen Smoky Mountain Bull ELK?! Elk can also be dangerous. Female elk with calves have been known to charge people in defense to their young. Male elk have also been known to charge people if they perceive them as a threat to their domain. Please keep your distance to avoid these hazards. At one time, elk inhabited the southern Appalachian mountains, but unfortunately, they were eliminated from the region by over-hunting and loss of habitat. The last elk seen in North Carolina was in the late 1700s when it was killed. The last elk was killed in Tennessee in the mid 1800s. By 1900, conservation organizations became concerned that the species would soon become extinct. In cases where a species has been eliminated from the area, the National Park service can choose to reintroduce them. In 2001 the Great Smoky Mountains National Park service began to reintroduce elk to the park. Twenty-five elk were brought here from the Land Between the Lakes National Reservation Area along the Tennessee-Kentucky border. Candy has been around since the cave man, who would eat honey off the honey comb. Over 3000 years ago, chocolate became known when the cacao trees reached the tropical lowlands of southern Mexico. It was then that cacao began to be used for culinary purposes. Candy as Americans know it has been around since the 1800s. The first packaged box of Whitman’s Chocolate hit the scene in 1854. Gatlinburg, TN is known for their numerous local candy stores. Candy Stores have been in Gatlinburg since the 1930s. Downtown Gatlinburg is the right place to be for a delicious homemade sweet treat. There are many myths about candy, but none as infamous as the myth that there is no such thing as healthy candy. The truth is, many treats such as lollipops, candy canes and gummies have no cholesterol or fat, making them a healthier treat than many people realize. Gum drops, most licorice products and many hard candy varieties are fat-free and have little to no cholesterol, plus, they are low-calorie. For example, a cup of candy corn contains fewer calories than the same amount of raisins. Salt Water Taffy is a big candy item here in the Smokies. The first recorded documents of Salt Water Taffy are dated from the late 1800s. Salt Water Taffy got its name in 1890 in Atlantic City, New Jersey when an ocean wave came ashore one night filling Mr. Bradley’s candy store on the Boardwalk full of ocean water. The next day, a small girl came into the store asking Mr. Bradley if he had any taffy. He replied, “Yes, I have salt water taffy.” Mr. Bradley’s mother overheard his remark and thought the name fit perfectly. In the early 1900s, this new candy was seen at County Fairs and soon many stores were opening. Salt Water Taffy came to the Great Smoky Mountains in the early 1950s and has since been a big attraction for travelers. Is it real “salt water taffy?” You decide. Below is a list of local candy stores in Gatlinburg and surrounding areas. Reserve your cabin with ERA In The Smokies now and join the Bass Pro Shops in Sevierville, TN every Tuesday, Thursday, Saturday and Sunday from June 8,2013 to July 14,2013 Noon to 5 P.M.. There are numerous activities for the whole family and the best part is they are all FREE! Bring the family together to learn about nature and make lasting memories in the Smokies. Carousel- Let the kids enjoy a ride while dad shops for new gear! Casting Challenge- Test your skills using a fishing rod and reel at the target casting area. Homemade Ice Cream- Saturdays only 5-6 P.M. while supplies last. Archery- Learn about bowhunting, equipment and safety tips and more about bowfishing. Birdwatching- Learn about the function of different types of feathers. Backyard Adventure- Learn about insets and animals that could be in your backyard and what they eat and if they help of hurt your backyard. Camping- Learn about the animals you might see while camping. Wildlife Exploration- Learn about mammals, reptiles, amphibians and arthropods. Exploring, shooting and hunting- Learn about the history of hunting and conservation benefits and safety tips. Water Safety- Learn about safety while swimming and boating. Outdoor Discovery and Conservation- Get tips on how to enjoy the outdoors and hiking, discuss comfort, safety and ways to conserve the beauty of the outdoors. While you’re here take the family fishing in the Great Smoky Mountains area! Click the picture above for a link to more information. True Southern hospitality had its humble beginnings with Smoky Mountain pioneer women. Everyone was always fed and friends and family always had a place to stay and visit. What little they had they gave graciously. The mountain women ran the home, worked hard for what they had and cared for everyone in the household. The national park staff and volunteers will perform live demonstrations of lye soap making, sewing, corn shuck crafts, hearth cooking, and traditional mountain music. Exhibits of artifacts and historic photographs will also be on display offering a glimpse of the past life of the mountain women. The Davis-Queen house will also be open to visitors, including an audio exhibit featuring the last child born in the house. The Great Smoky Mountains National Park is hosting a very special event honoring the traditions of rural Appalachian Mountain women on June 15, 2013 from 10:00 A.M. to 4:00 P.M.. The event will be held at the Mountain Farm Museum located next to the national park’s Oconaluftee Visitor Center (Newfound Gap Road, U.S. Highway 441), 2 miles north of Cherokee, North Carolina. This event is free and open to the public. There are often seen Bull Elk in the field beside the Oconaluftee Visitor Center. Make sure to watch for these magnificent creatures!